The following disc comes from the Old Time Blues Collection’s selection of rare and unusual record labels. It is one that while seldom encountered holds a unique and important place in the history of the recording industry, and bears a rather unusual, Scandinavian name: Nordskog. The Nordskog Phonograph Company was founded by Andrae Nordskog in 1921 in Santa Monica, California. As was emblazoned so proudly on their labels, they were the first record label based on the United States’ West Coast. Although their material was recorded locally in Los Angeles, they contracted an East Coast company, The Arto Company, to take care of pressing. This setup meant they had to ship their wax master from one coast to the other, by railroad. Unfortunately, many masters didn’t survive the journey. In spite of their rather makeshift manufacturing process, Nordskog managed to attract some significant talent, including “Queen of Vaudeville” Eva Tanguay and jazz legend Kid Ory and his Sunshine Band, and they had the distinction of producing the first recordings of several notable West Coast dance bands, such as those of Abe Lyman, Henry Halstead, and Herb Wiedoeft. Others included material by popular East Coast artists like Arthur Fields and Charles Harrison, drawing from Arto’s catalog. Trouble came in 1923, when Arto went out of business while in possession of all Nordskog’s masters. The company filed suit for the return of their property, but nothing materialized, and it was all too little and too late for Nordskog, for they too folded soon after, having released little more than fifty records. Nordskog 3004, the fourth release on the fledgling label, was recorded early in 1922 in Los Angeles, California. Herb Wiedoeft’s name is misspelled “Weidoeft” on the label. Although not listed in either Rust’s Jazz and Ragtime Records or American Dance Band Discography, the personnel probably resembles that of Wiedoeft’s recordings for Brunswick the following year, which featured Herb Wiedoeft on trumpet, Joseph Nemoli on cornet and viola, Jesse Stafford on trombone and baritone horn, Larry Abbott, Gene Siegrist, and Fred Bibesheimer on reeds (clarinet, alto sax, tenor sax, and oboe), Vincent Rose on piano, Jose Sucedo on banjo, Guy Wiedoeft on tuba and string bass, and, Adolph Wiedoeft on drums and xylophone. First up, they play a nicely orchestrated rendition of the popular 1922 jazz hit, “Virginia Blues”, perhaps most famously recorded by Ladd’s Black Aces featuring the recording debut of Cliff Edwards. 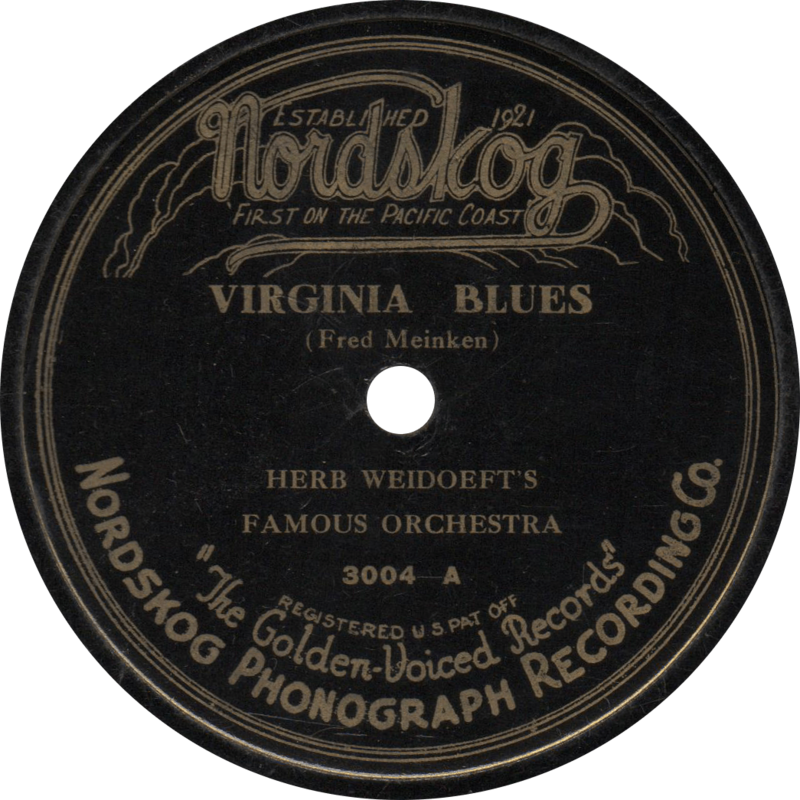 Virginia Blues, recorded in 1922 by Herb Weidoeft’s [sic] Famous Orchestra. On the “B” side, they play Nacio Herb Brown and Gene Rose’s oriental fox trot “Persian Nights”. This appears to be the only version of this tune to have been recorded. 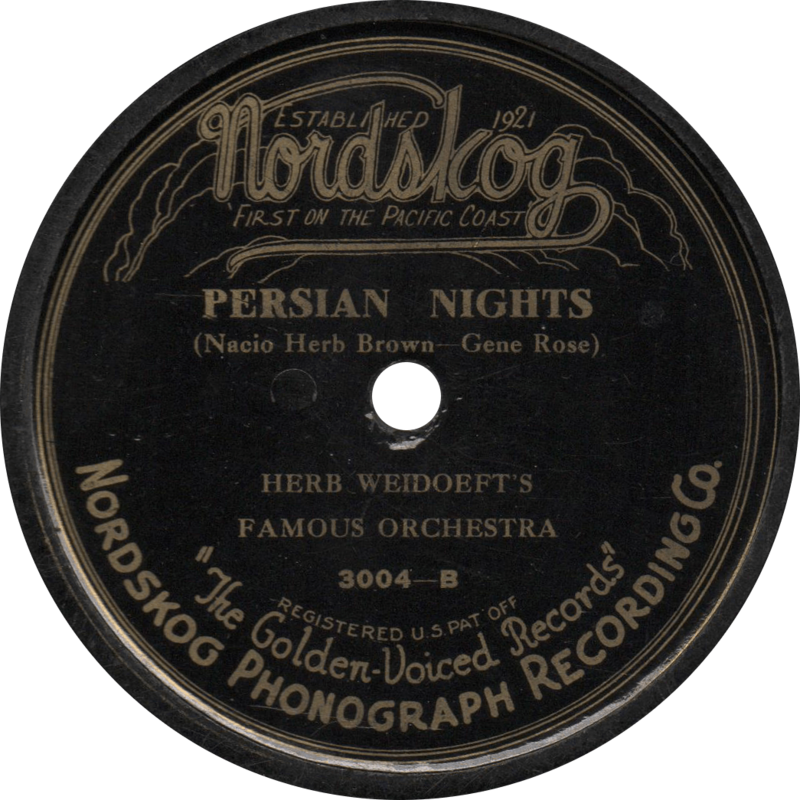 Persian Nights, recorded in 1922 by Herb Weidoeft’s [sic] Famous Orchestra.